What type of Saw Are you Looking for? MILWAUKEE 2731-21 M18 Fuel 7-1/4"
Owning the best circular saw is something that many craftsmen strive to achieve, as they want tools that not only meet their needs for demanding projects but that also exceeds their expectations. Today’s market is flooded with models boasting their “can top this” features and high-quality performance when in fact they don’t deliver, and it is all hype. However, don’t let the daunting task of sifting through the good and the bad trying to find that special tool that does all it says it will do and then some deter you away from making that investment. We will do that work for you. We are delivering you with an extensive list of the markets most popular and reliable tools and breaking them down in easy-to-read pros and cons to help you find the one. 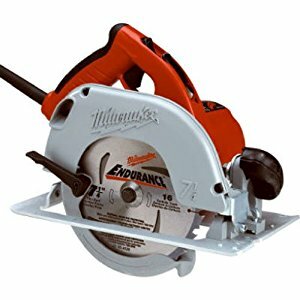 Sidewinder’s are another name for circular saw. The motors location is on the left or right side, this is dependent upon if you want a left-handed, or right handed saw. Worm-drive saws are beasts. They’re heavy to maneuver and awkward for the beginning user. However, this why you see many framers and carpenters with Popeye type forearms. If you’re looking to rip through heavy dense wood, than this is the perfect model. Otherwise, for basic needs, just purchase a good sidewinder. Cordless saws are the perfect solution for quick jobs that don’t require a lot of cutting and ripping. They come in 18v, 20v, and 36v power options. The battery life last quite a while, so don’t feel like this isn’t going to do the job. The RPM’s are pretty high and torque. 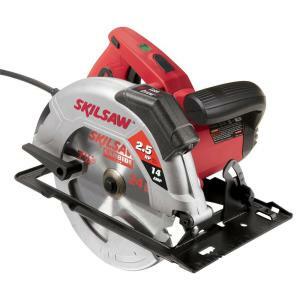 Here is the SKIL 5680-02 15 Amp 7-1/4-Inch SKILSAW that includes a laser for a cutline guide for precision. For increased accuracy, you will have 51 degrees bevel with a positive stop at 45 degrees. It has a ball bearing motor construction that extends the life of the tool compared to the previous model. Users will get the benefit of rear view depth adjustment for better visibility and quick cut-depth changes. 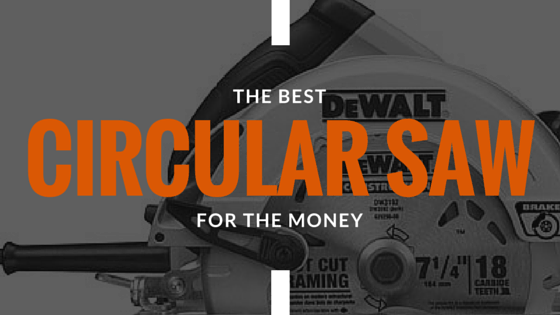 This is the best budget circular saw that you can buy..
Q – Is the laser adjustable? Q – Does it include a rip fence? A – No rip fence included. Q – Does it have a case? A – The product comes with a soft case. 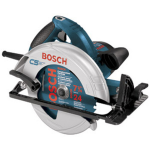 Here is the Bosch 7-1/4″ model with a take charge 15-Amp motor that only delivers quick and smooth cutting at different angles. Highly advanced composite footplate provides increased precision and stability for more accuracy. This brand by Bosch is user-friendly with effortless control and comfort weighing in at only 10.3 lbs with a soft-grip handle. Q – Is there a blade brake? A – No there is not. Q – Is this product for left-handers or righties? A – The CS10 is for right-handed users, but you can purchase the CS5 that is for the left-handed operators. Q – Is there a hard case included with purchase? A – You get a soft canvas carrying case, but no, not a hard case. Q – Does this model come with a rip guide and is it setup for one? A – No and yes. It doesn’t come with a rip guide as that is bought separate, but it is setup for one. Here is the Makita 5007MG 7-1/4″ Magnesium model that is unmistakenly robust and built to handle demanding tasks. Using a powerful 15-Amp motor the 5007MG balances power, weight, and durability while being easy to handle. Users will love the built-in dust blower eliminating mess from covering the line of cut for the ultimate precision and accuracy. Ideal for floors, roofs, and framing walls, etc. It gets the job done and is best circular saw for the money. See our in-depth review. Q – Does it come with a carrying case? A – Yes! Not only does it have a carrying case but it’s a hard one not like some of the other models that have a canvas soft carrying case. Q – Is the guide accurate or have anybody experienced any slipping? Q – Is there an electric brake? A – No. This model doesn’t have an electric brake, but the 5007MGA model has one. Q – Do the LED lighting stay on continuously while cutting? A – Yes. It stays on the entire time the unit is on. 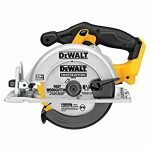 DEWALT DW364K model with Electric Brake is lightweight at 8.8 lbs with a 15-amp powerful motor showing greatness can be compact. Users will enjoy the convenient dust blower that is built-in reducing dust and debris from interfering with the line of cut. The ball bearing lower guard will glide effortlessly for each cut regardless of outdoor cold weather. Delivering 5200 no-load RPM this high-powered model also has a trigger-sensitive electric brake stop to avoid accidents. Read our in-depth review. Q – Is there a rubberized grip on the handle? Q – Is this model designed for right-handed users? Q – Will this be suitable for a beginner? A – Absolutely! It’s a heavy-duty saw ideal for tough jobs but easy to operate and will last. Q – Does the model come with a laser? Q – Is there a rip guide? A – No there isn’t a rip guide. Q – Will it have an electric brake? A – No electric brake. Here is the SKIL 5995-01 18-Volt 5-3/8-Inch SKILSAW model that is lightweight to reduce user fatigue increasing productivity. It also includes a convenient anti-snag lower guard feature allowing for narrow cut-offs. Cutting crosscut and ripping 2x the material effortless making this unit ideal for any job sites. Q – Is there a blade included? Here is the Bosch Bare-Tool CCS180BL 18-Volt Lithium-Ion 6-1/2-Inch model with amazing precision and powerful cutting. 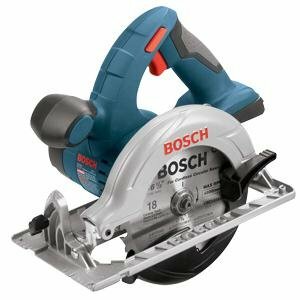 Powered by a Lithium-Ion battery this cordless saw created by Bosch us ready for all day action regardless of the tasks at hand. Built to provide 50-degree bevel with an adjustable depth and an electric brake this unit is hassle-free and convenient with its cordless feature. Q – Is there Blade & Allen key included? Q – Does it include a blade? A – Yes. Includes CCS180BL includes a 6 1/2″ 18 tooth carbide blade. Here is the Makita XSH03Z 18V LXT Lithium-Ion Brushless Cordless 6-1/2″ model with a brushless motor that has a combination of faster runtime, extra power, and faster ripping and cutting without the need for a long cord hindering user portability. This model is loaded with an automatic speed change technology that adjusts speed and torque while cutting for enhanced performance. Built to last a long time. Read our in-depth review of this saw. Q – Does it have an electric blade brake? Q – Does it include a LED light? A – Yes! It works great at illuminating the line of cut for precision in low light areas. Q – Does have a bevel stop of 45-degrees? A – Yes and there’s a flip tab for 50-degrees bevel stop. The depth of cut at 45 degrees: 1-5/8″. The depth of cut at 90 degrees: 2-1/4″. Q – Is the rip fence included? A – Yes there is a blade included with the model. 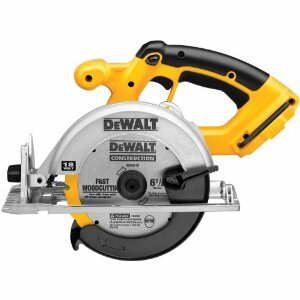 Q – Will the Dewalt 20v batteries from my drill work on this model since batteries aren’t included? Here is the MILWAUKEE 2731-21 M18 Fuel 7-1/4″ model that cuts faster than previous models and weighs an astounding 40% LESS than its corded counterparts reducing user fatigue and increasing portability. It uses a POWERSTATE brushless motor delivering twice the runtime than any other 18-volt unit out there. It is designed with a convenient LED light to illuminate over the line of cut for accurate precision. Read our in-depth review. Q – Is there a built-in dust collector? A – No. There’s no dust collector or a vacuum port. Q – Is there a hard case? A – No. Includes a contractor’s bag. 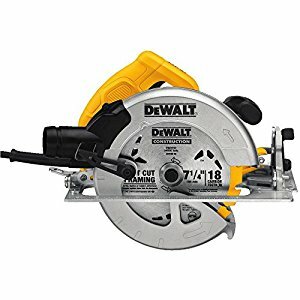 Q – Can I use metal cutting blades on this model or should I buy a saw meant for cutting metal? A – This unit can cut medium metal with the proper blade, but for anything heavy-duty you will need a metal cutting saw. A buzz saw is one of those “must have” tools for the everyday tasks at job sites or a home DIYer. When working with the right blade, these types of models can cut wood, steel, ceramic tile, masonry, etc. Here are some top buying guide tips to help you find the right brand for the job. 1. HOW DEEP CAN YOU CUT WITH A CIRCULAR SAW? The most common blade sizes for a buzzsaw is 7-1/4 inches. However, most models can cut through 2 inch dimensional lumber with ease at a 45 degree angle with one single pass. Although, a blade measuring 5-3/8 inch can rip through 2 inch lumber with two passes at 45 degrees — for 90 degree cuts, 7-1/4 down to 5-3/8 blades with cut perfectly fine with one single pass. 2. CAN YOU USE A CIRCULAR SAW TO CUT METAL? You can, however, you’re going to need a metal cutting blade to cut through metal framing studs, etc. I recommend the Diablo 7-1/4 inch by 48 tooth steel Demon Ferrous metal cutting saw blade — this blade works like a gem and lasts longer than most metal cutting blades. I use Diablo blades for all of my finish work. However, I personally wouldn’t use a good saw for cutting metal. The choice is yours. 3. WHAT ARE RIP CUTS AND CROSS CUTS? Rip cuts are when you cut along the wood grain and cross-cuts are when you cut across the grain of the wood. Cutting along the grain is the easiest cut to make because you are essentially splitting (ripping) the wood at it’s weakest point – kind of like using an axe to split a block of wood. Cross-cuts, however, is much more harder on the tool as you’re cutting across the fibers and not alongside them — you’ll notice when cutting through the 2x dimensional lumber the difference in how hard you’ll need to push the tool to cut. 4. WHAT IS THE DIFFERENCE BETWEEN A SIDEWINDER AND A WORM DRIVE? The big difference is the weight and the positioning of the motor. Worm-drives are meant for demolishing and for when you need to rip through thick dimensional lumber. If you ever wondered how builders always seem to have massive forearms, it’s because they use worm-drives a lot — at least that’s what i say to my friends. Also, Worm drives have a spiral thread on the shaft at right-angles to the blade shaft. Sidewinders ( your basic circular saw) the blade shaft and motor shaft are lined up on either the left or right side – depending on whether you buy a left-handed circular saw or right sided. 5. DO I NEED A LASER GUIDE? This is entirely up to you. For myself personally, I could careless if it had a laser and I don’t feel confident in following it as I rip a piece of plywood — I trust my straightedge lines. 6. WHAT IS A DADO BLADE? A dado blade is commonly used in cabinetry. Dado blades cannot be used in a circular saw and is only meant for a table saw. These types of blades are used for making wide notches, or large slots in plywood for shelving or cabinetry — this is a must have for many woodworking projects. 7. WHAT IS THE POINT OF A RIVING KNIFE? This is a safety feature that’s pretty much a standard. Basically, it glides along the board or wood you are cutting or ripping and keeps the wood down and prevents the wood from kicking back towards you as you cut forward — this can happen when the wood binds the blade. You’ll see some guys wedge a piece of wood to keep it up for when they’re doing siding or trim — don’t do this. I’ve seen some scary situations come from messing with the riving knife. 8. WHAT IS GANG CUTTING? Gang cutting is basically staking multiple pieces of plywood and ripping through them in a single pass. This helps speed up production when you need to cut multiple pieces of wood that are the same size — just be sure to clamp them together or hold them tightly. 9. 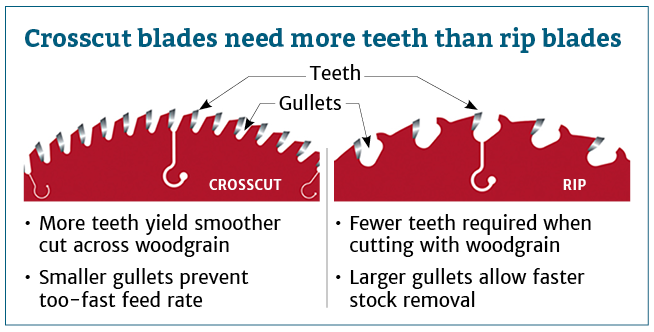 ARE CIRCULAR SAWS ANY GOOD FOR PLUNGE CUTS? They sure are. I’m guilty of plunge cutting a lot when I’m framing houses. However, if you’re looking to do clean and neat looking plunge cuts, definitely go a purchase a plunge saw. 10. 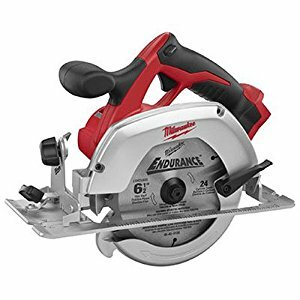 IS IT DIFFICULT TO CHANGE THE BLADE ON A CIRCULAR SAW? No, this is pretty easy to do – even if your model doesn’t come with hex key. On most models, there’s a push lock located on the front or side of the saw. You want to simply push that lock in and spin the blade until it locks into position for you to loosen the nut — please be sure that your tool is unplugged! A blade guard: It is a cover for the blade when the tool isn’t being operated and will retract to expose the blade during use. A foot plate (or shoe): that steadies the tool against the work piece. A depth adjustment: to allow for work pieces of different thicknesses. A bevel adjustment: that lets the foot plate tilt with the blade for making bevel cuts. Circular saw sizes are commonly sorted by the diameter of the blades. Sizes of 5-1/2″ to 7-1/4″ are the standard. There are plenty of options for power saws. Decide on the model based on your particular needs. The best 7 1/4 blade is entirely dependent on the type of woodworking project. For finish work, I recommend at 60 tooth blade for smooth finishes, like laminates, MDF, oak, etc.. For rough cuts such as: Plywood, 2×4’s, etc.., grab a 24 tooth blade. The best circular saw blades on the market are the Frued blades. Sidewinder (or inline saws): are the popular and the most used saw, traditional power saws. The motor is found parallel to the blade. A shaft goes directly from the motor to drive the blade. Sidewinder saws are more user-friendly, lightweight, and compact than worm drive saws and are well-suited to most applications. Worm drive: saws come with their motors positioned at a right angle to the saw blade. The motor uses gears to deliver more torque to be transferred to the blade, which makes the saw well-suited for heavy-duty use. Worm drive saws are much longer than sidewinder saws and make less noise. Mini circular saw: These compact saws use a 4 1/2″ blade and are perfect for small project. I mostly use mine for when I’m installing wood siding. The best compact saw in my opinion is the Rockwell 4-1/2″ mini powered Saw — Others may suggest the Makita. Either way, both are really good for tight cuts. 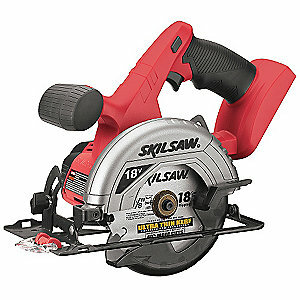 What types of power saws are there? 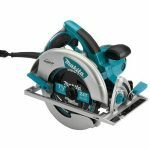 Cordless Circular Saw: Are highly-portable and greatly needed when on a job site that requires mobility to not reduce productivity by being confined to one spot. They’re especially great for when working in tighter spaces. They work well with cutting wood products and can cut through many types of tough material. However, the tougher the task the quicker the battery drains. 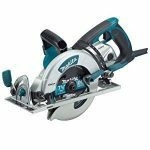 Corded Saws: Don’t need to worry about having to be recharged as there supply source is continuous and ready to tackle demanding jobs such as steel, masonry, wood cutting. They’re available in many sizes with 7/1/4″ being the most used size. This type of model requires a long extension cord and each manufacturer have their particular cord they want to be used with the saw. Electric brake: This reverses the flow of power to the motor when the trigger gets released, as changing the current will STOP the blade’s momentum within seconds or instantly. Laser Guides: The laser helps enhance the precision and accuracy of each cut by projecting a laser beam onto the work-piece. Spindle (or shaft locks): This allows the changing of the blade to be a lot easier. Bevel Capacity: Will indicate the maximum cut that the unit can make. Bevel Stops: Feature allows for quick and easy preset adjustments for bevels while working. Steel plates are common on the less expensive models, however they have a few downsides. First, they do tend to bend if you were to drop your tool. Furthermore, they do tend to roll up (curl) up on the edges – this ends up causing problems if you need to run your tool alongside a straightedge to achieve precise cuts. As a professional builder, I prefer to purchase a brand with a magnesium base plate. 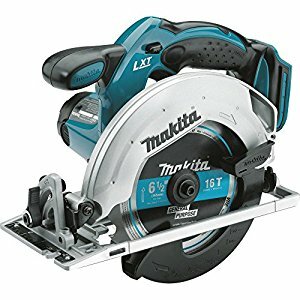 I own and personally love, the Makita 5007mg and feel that it’s the best circular saw on the market — it has a magnesium base plate, it’s lightweight, has a laser guide, and it performs smooth cuts through wet or dry dimensional lumber with ease. If you’re looking for extra bevel capacity, the majority of brands cut bevels beyond 45 degrees. Is this a must have feature, well, if you’re a framer and need to cut-in hips and valleys, having a model that will cut beyond 45 degrees is a must have in any toolbox. Many of the higher-end units (above 100.00 dollar range) will also have indents to help you cut the perfect 22.5 or 45 degree bevel cut for that outside or inside corner trim with positive stops that don’t interfere with the operation while you’re making your rip.